Smokers on the go can breathe a little easier. With an innovative, easy-loading spiral design, the Twisty Glass Blunt offered a smoother, more consistent draw than conventional pipes. 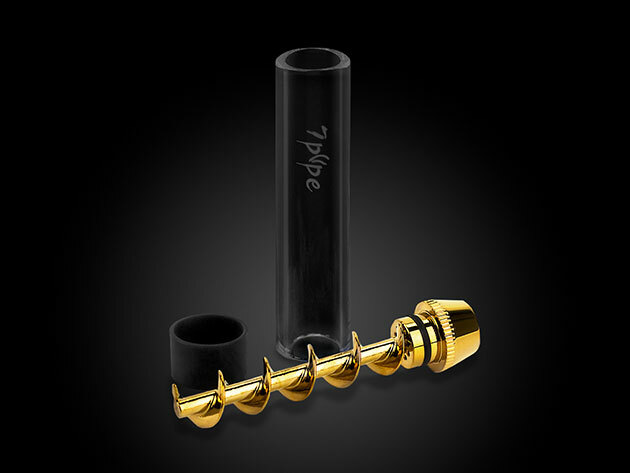 Now the Twisty Glass Mini delivers the benefits of its heavy-duty sister pipe in a more discreet package. For those that haven't already made the Twisty Glass Blunt their new smoking buddy, the Mini loads just as effortlessly. Just pack up to .5 grams of the tobacco of your choice into the tube, twist the screw and light up. The smoke travels through five chambers into a cherry that's a particular highlight of this model. (It's 50% smaller and therefore a cleaner hit.) It all adds up to a smoking experience as smooth as it is compact, and it cleans just as easily - just twist the screw out. Want an even more comfortable hit? The mini is compatible with your favorite water pipe. Right now, the Twisty Glass Mini is $39.99, more than 20% off the MSRP of $50.99.